In his biggest role since he appeared as “The Force” in Star Wars, Chuck Norris joins the Glock team as their latest Spokesperson. 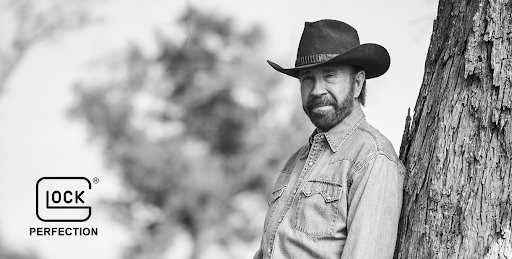 Chuck Norris revolutionized and ushered martial arts into the American mainstream just like GLOCK revolutionized firearms by inventing and commercializing polymer-based pistols and the SAFE ACTION® System. Having him represent the GLOCK brand brings two iconic names together that are mutually committed to perfection and their fan base. We couldn’t be more excited about this partnership. Of course, this news comes just one year after the passing death of their old spokesperson, and one of my personal heroes, R. Lee Ermey. I’m honored to partner with this world-renowned brand. The values that I have built my life and brand on—tough, real, constant and powerful—are echoed in everything that GLOCK does and creates. Let me put it this way, if I ever decided to go into firearms, there would be no point—I would just be recreating what GLOCK has already built. The only thing that would change is the name. This partnership includes regular spokesperson duties, to include guest appearances at places like the NRAAM coming up later this month in Indianapolis, Indiana and others like the yearly National Shooting Sports Foundation conference in Las Vegas, called SHOT Show. If you own a Glock and dryfire practice, you need this tool. If you have any thoughts on this new partnership, let us know in the comments below. Also, just for giggles and spits, drop your best Chuck Norris Fact (like the Star Wars one above) in the comments section, below. Here is a Glock 42 review, if you're looking for more. Please tell me Glock is thinking about creating a Chuck Norris model Glock! Heck, let’s also have them make a commemorative one in the Gunny’s name as well! So why bother posting or even being here. You certainly have the right to be here, but with all the negativity in the world – why add more? Best to you. So Glock will be open carry Chuck for protection? I have been a fan of Chuck Norris’ for over 30 years and that’s about how long I’ve had my first Glock 19. I personally think this is a marriage made in Heaven & I am so thrilled for both the company & Chuck Norris. Regardless of whether people agree with me or not; Glock just mixed themselves (a phenomenal brand) with Chuck Norris (a phenomenal brand) and I personally couldn’t be more thrilled. We will all miss Gunny, and I sincerely doubt that Mr Norris was brought in to replace him…how can one replace another? I’m personally thrilled for the alliance, own over 25 Glocks, and every movie Chuck Norris ever made. If you can see Chuck Norris then he can see you. If you can’t see Chuck Norris you may be only seconds away from death…. Well someone Like Dave Lauck From American Handgunner Mag Sept/Oct 2012 Page 54 & 55 picture Is Awesome Picture of a Smith And Wesson Model 29 44 Mag Engraved And Gold Plated Name On One Side Clint Eastwood On The Other side Harry Callahan. Given To Clint Eastwood for His Own Personal Office. Why Not Chuck Norris aka Col Braddock.Would Be Nice.!!! What Do You Think Maybe Texas Ranger.or Both . Glock will have to recall all Pink Glocks as defective.